Life in one tiny seed…by magic it turns into a set of stems and leaves, and becomes a plant! Soon the main performance will begin in the garden. Soil is now, or should be, warm enough for planting everything! In just the last two weeks…”June is busting out all over…” in mid-May! Spinach and lettuce grown from seed are ready for picking…carrots need another month and plenty of rain. Potatoes are set to bloom and will harvest them soon…Every new season of change brings excitement as leaves and buds burst open. The hydrangeas are no longer just sticks but full of green foliage and tiny bracts impatient to open and the hairy knuckles of Royal and Lady-in-Red ferns are flexing and unfurling their delicate fronds…filling in the space by the front porch. The Mock Orange bush…Philadelphus virginalis… that I struggled for hours to dig up and transplant last fall is covered in blooms… This is really an outstanding deciduous shrub showing double white flowers that have a rich, sweet, almost “citrusy” perfume that lingers in the garden and in fresh bouquets for my home. The flowers only last for a few weeks but I love this shrub for its graceful shape and structure that adds a nice spring surprise in the border. 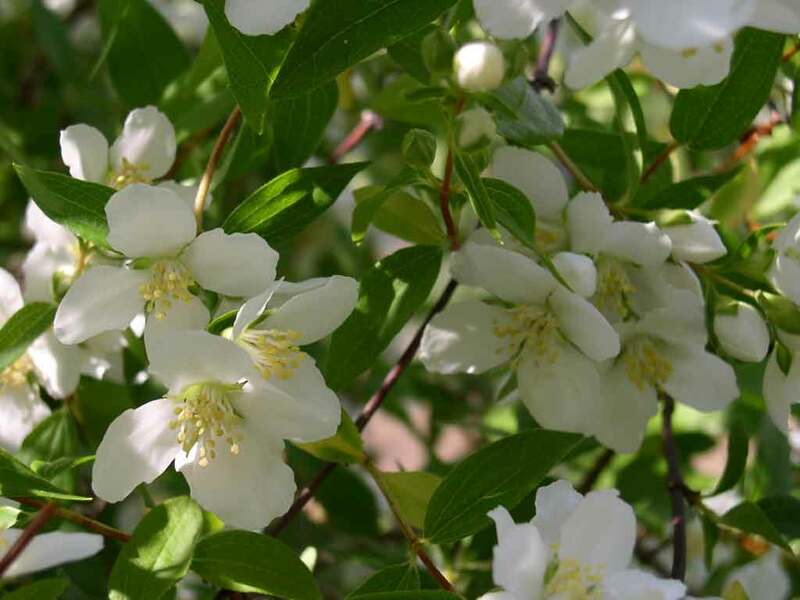 It can be used in groups or just as a specimen plant…Mock Orange is hardy in zones 4-8 and enjoys sun to part shade and moist, well-drained soil. I always spread compost around the base of this shrub as well as my Lilacs AFTER they finish blooming. Keep the soil mulched around the shrub and any pruning should be done soon after the blooming period. Simply prune off the growth just above the outer-facing buds on stems that have finished flowering. 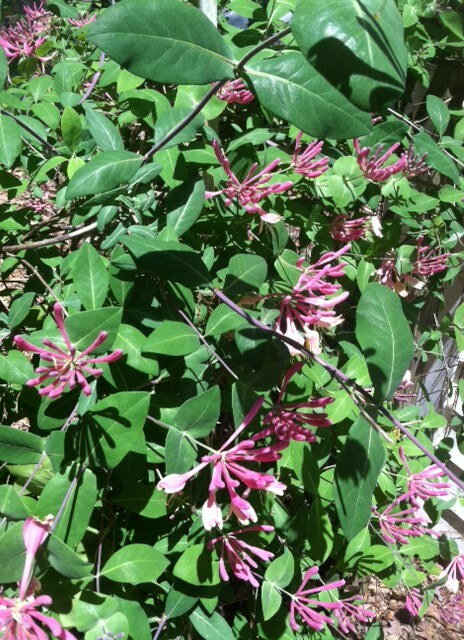 Hummingbirds adore this blooming vine…Pink Honeysuckle. It scrambles along the fence by the chicken house tempting the tiny birds to enjoy the nectar and to heck with the sugar feeders!! Well, not really…they do both! 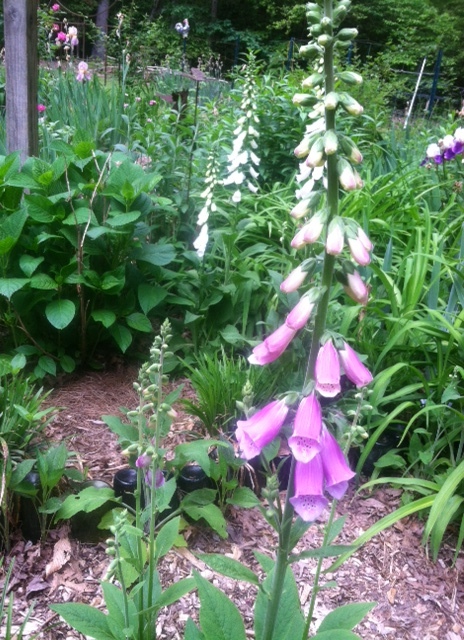 Foxgloves are ideal early bloomers enticing the tiny hummers with their unusual bloom stalks! I planted these 5-6 years ago…only 3 small pots…and they have reseeded nicely throughout the partially shady area. What’s coming into season…? 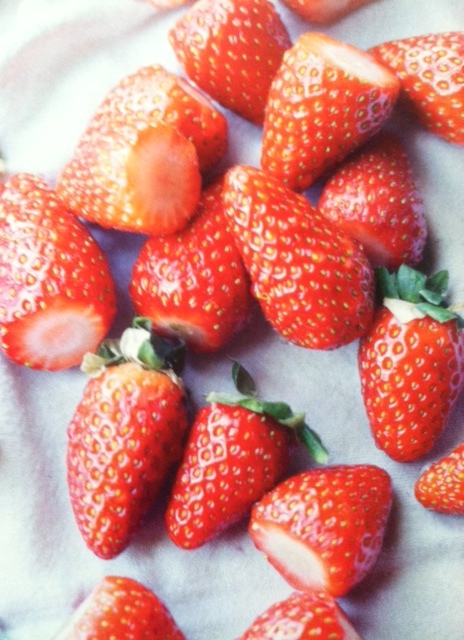 Strawberries, inextricably linked with the arrival of early summer…ripe scarlet strawberries, intensely fragrant, juicy and sublimely ever so sweet. My favorite variety is the little Alpine berry that typically grows in the mountain meadows of France. I started six years ago with just a few 4″ plants and now have a 8×6 plot of strawberries that produce enough to enjoy fresh each morning and to also make a few jars of preserves. I’ve given several plant starts away and had the plot invaded by phlox so I’ve had to clean out and start again! Whip 1/2 cup heavy cream in another bowl until starting to get thick, add 3Tblsp. of sugar slowly and continue to beat until cream is thick. Fold the whipped cream into the sour cream mixture and serve over strawberries…YOU WILL BE HOOKED ON THIS!! This photo shows the gorgeous little foliage and tiny blooms and berries in my strawberry plot. To prepare a good berry spot, the soil should be well-drained and loamy…mix in compost and rotted chicken manure into each hole as you plant little starts…plant using liquid seaweed as a root stimulator and mulch with pine straw if you can get it, if not, straw works, too. Cover any bare soil with more compost and then mulch. Keep the plants watered well until their little roots establish into the soil. A pitcher of fresh picked flowers on an old metal or wood table, an array of mismatched vintage garden chairs made comfy with plump cushions in faded florals…Antique quilts for the back of a porch swing…Enjoy a glass of wine and later an alfresco supper with the fragrance of lavender and roses drifting in from the garden…For lighting as the sun fades, antique oil lamps gathered on the tables. Sunny morning, blue skies, no humidity…perfect drying weather. Washing done, it’s on to hang out my clothes on the line to dry…Later, while gathering, I bury my nose in the sheets and towels…loving that sunny, fresh smell like no other…not even a silly dryer sheet can compete! Stopping for a while to just wander down to the creek...I am so pleased to find a flotilla of Canada geese with their little goslings lined in a row behind one parent while the other parent protects the flank…paddling along the creek bank. Parents showing their young what to eat and how to watch out for dangers…The loyalty of geese families is unusually strong. No other bird in the same degree possess their characteristics of strength, wariness and fidelity…in many respects they serve as a model for man. Holly and I sat quietly and watched while the geese explored…and wondered about the beauty and majesty of Mother Nature’s creatures. 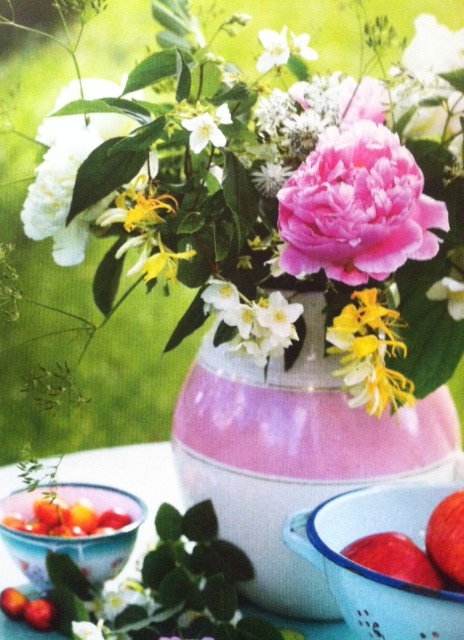 Previous Article Lilacs & Roses, Wine, Friends…and Myrtle Murder!